Don’t be fooled by the weekly reports saying home prices are on the rise in Atlanta. That’s not the case in some neighborhoods, and there’s a pretty good explanation. 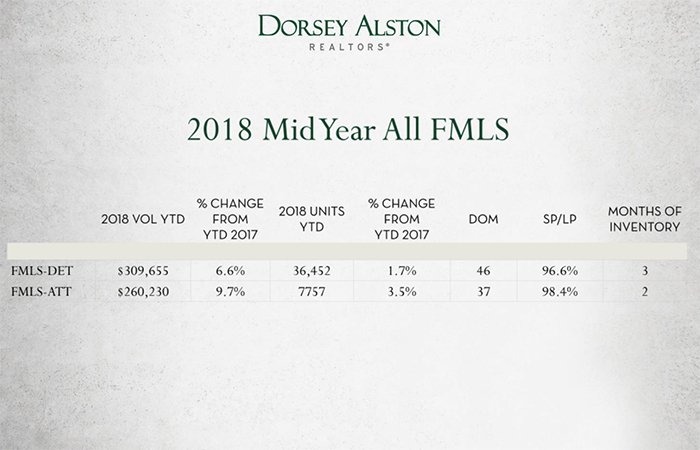 Dorsey Alston Realtors has researched the average home prices, and, more importantly, the closed sales in the school districts and neighborhoods that are most important to our buyers and sellers. We have found the increases in home prices depends on where you live. The multitude of reports saying metro Atlanta home prices have increased by a certain percentage is not a fair or accurate way to discern what is really going on your street. In fact, when we look at certain submarkets and specific price ranges, we found homes were sitting on the market longer and not moving even with the dearth of inventory. 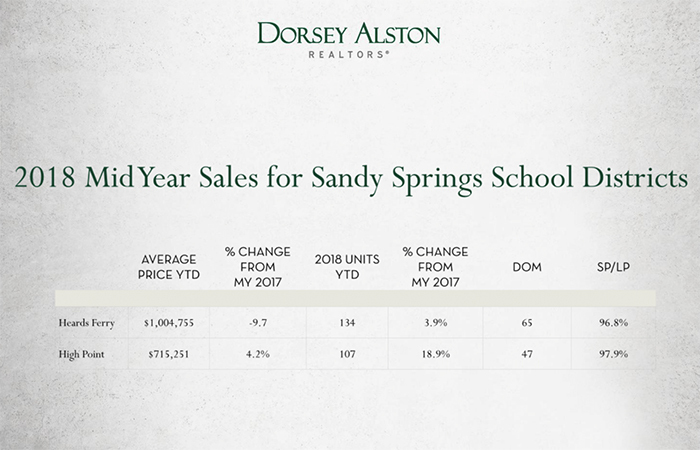 In Sandy Springs, in the perpetually popular Heards Ferry School district, where the average home price is just over $1,000,000, FMLS data shows home prices have dropped - yes, dropped - 9.7 percent from the same time last year. In East Cobb, in the Walton High School cluster, midyear home prices average $580,000, which is down .5 percent from this time last year. 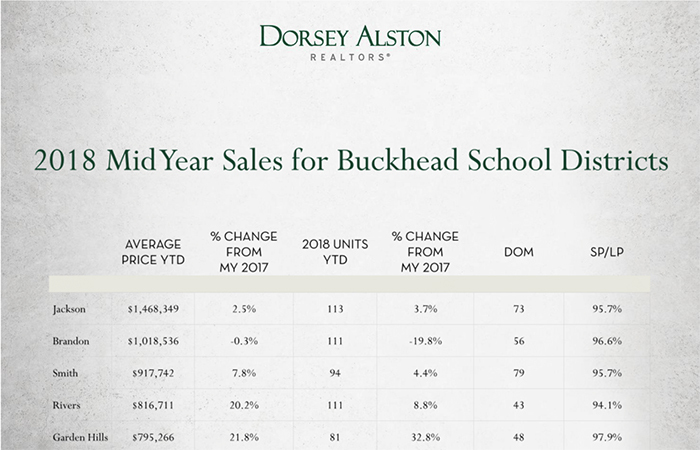 In Buckhead, in the Morris Brandon Elementary School district, the data shows a .3 percent drop in home prices compared to last year, while the always strong Warren T. Jackson Elementary School District experienced a 2.5 percent increase, well below the Atlanta average of 6.6 percent. It’s a matter of market. Clayton County and Henry County, both considered part of the metro Atlanta statistical area, were decimated by the 2008 recession. Home values in those markets collapsed precipitously in the wake of the crisis. Those homes — many of which were foreclosed on and valued well below market as a result — are now changing hands as buyers seek for value. Those are large percentage increases, and skew the numbers for metro Atlanta. That being written, we do see some opportunities to find that value in close-in neighborhoods. In Brookhaven, for example, we are seeing solid growth around both the Montgomery Elementary School and Ashford Park School districts, where home values are up 11 percent over this time last year. And there are still quality homes in those neighborhoods that have tremendous upside. We are seeing the same in Smyrna, where the average home price remains relatively affordable despite an uptick in value of 11 percent. The take away for our clients is to not believe the numbers, unless your Realtor is willing to dig down not just into your submarket, but into your school district, and some cases, down to your specific neighborhood and the street you live on. The metro numbers don’t reflect what a lot of buyer and sellers are experiencing.